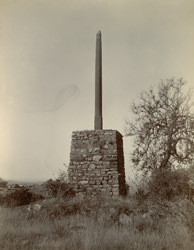 Photograpah of the Bhim Lath at Bayana Fort in Rajasthan, taken by the studio of Priyalall & Company in c.1900. This is a view of a lat mounted on a stone in the ruined hill fort near Bharatpur. ‘Lat’ is a Hindi word meaning a staff or pole and is used for obelisks or pillars which often commemorate military victories. The fort in which the lat stands was originally the capital of the Jadon Rajputs, but was twice possessed by Muslim invaders, once in the 11th century by Mahmud of Ghazni, and then for a period of 500 years from the end of the 12th century by the Sultans of Delhi and later the Mughal Emperors. At the break up of the Mughal Empire Bayana became a part of the territory of the Jat rulers of Bharartpur.